It is no longer news that many medical professionals around the country routinely preach to and encourage their patients to seek religious solutions to their physical and mental illness. In addition to that, many certified medical professionals also come on air to collaborate televised miracle healings by religious leaders on live television. 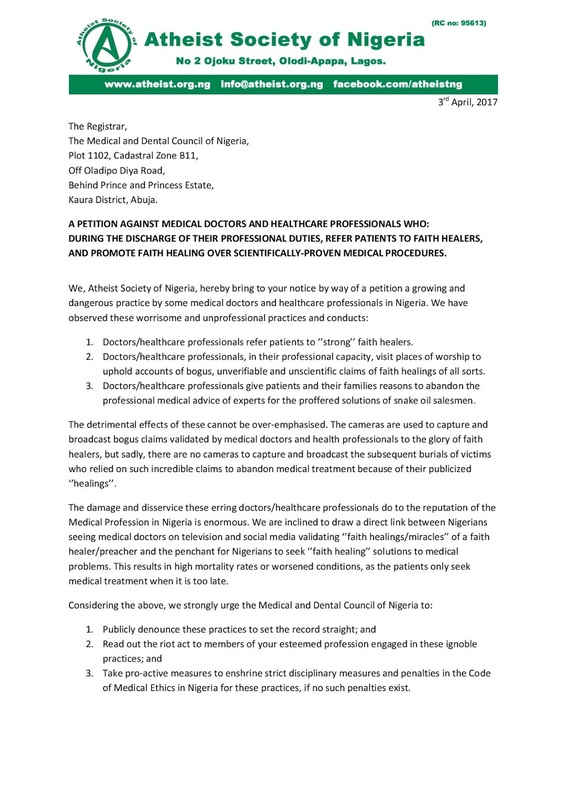 The negative impact of this type of practice cannot be over emphasised, especially as many sick people routinely visit these religious centers and only come to the hospital when their case have become too critical. In a country where the health care system is below standards and there is a paucity of health care practitioners, it becomes a matter of professional and ethical irresponsibility to encourage patients to seek unscientific, unproven and virtually un-provable solutions to their medical problems. Clearly, something needs to be done to checkmate this unhealthy practice. 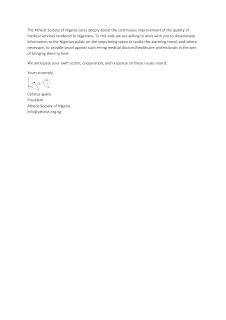 As its first official activity, the Atheist Society of Nigeria (ASN) petitioned the Nigerian Medical Association to look into and discourage the practice of its members preaching to and referring their patients to imams and pastors for spiritual solutions to their physical and mental problems as this further puts the health care practice of the nation in further jeopardy and discourages our professionals from working too hard to seek proven scientific solutions to the problems of their patients. 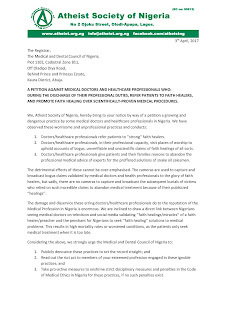 Although there was no official reply from the Nigerian Medical Association, it was gathered mostly from anecdotal sources that the contents of the petition was discussed at the high echelons of the organisation and directives were given to their members that doctors should consult with their department heads before referring patients outside their hospitals. 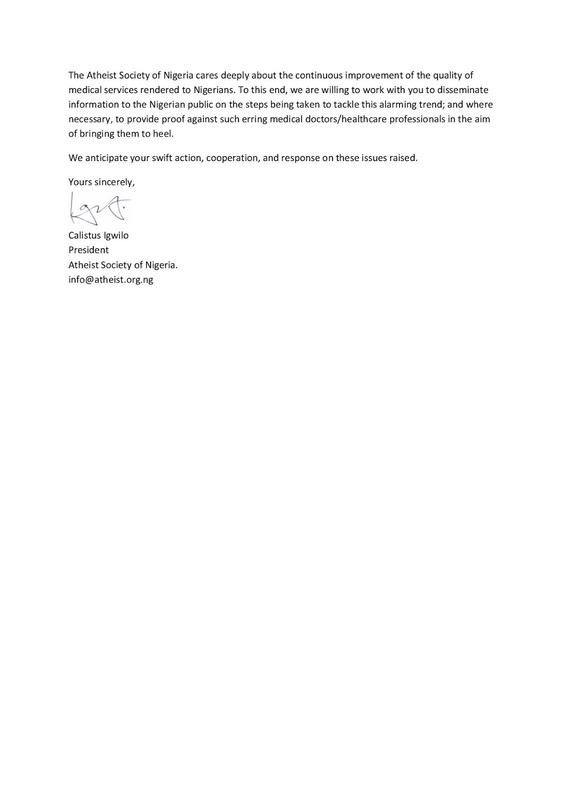 Even though this falls short of the expected outcome of the petition, we prefer to look on the bright side and consider this a small step in the right direction for Science and progress in Nigeria.